Among the more unique and subtly powerful features of Second Life is the ability to detach your point of view from your avatar. This lets you move the camera position of what you're seeing on your monitor dozens of meters away from where your avatar is actually standing. I can't think of another virtual world that allows this, even though Residents take it for granted that the avatar standing next to them could actually be looking at, say, the third floor store display in the building behind them, at the fish swimming ten feet down in a nearby cove-- or for that matter, up their skirt. 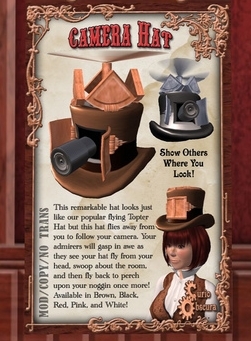 If you're uncomfortable with that omniscience-- or if you just want another cool gadget-- steampunk inventrix Pandora Wrigglesworth has a propeller-driven hat camera that she's scripted to fly around follow your camera position. Crap Mariner has the details, with Craptastic video demo. But it was a funny link. i laughed alot reading that. Pandora makes the coolest stuff. Every Sunday's Show-And-Tell at Lummerland is an absolute treat, but extra-special when Pandora comes out of the labs with a new creation. Ack, thanks Patch, fixed the link. Two of my fave things: steampunk and followcam! Both of which get spurts of excitement when publicized, but can sometimes be unjustly underrated. This must only be kewl.